There are plenty of 'almost' invisible systems about, but Stealth Acoustics has produced a range of flat panel speakers which cover all ranges and can all be flush-fitted into a wall. Admittedly, all this technology costs. Not only for the product, but also for the installation, which could cost about £80 per hole in a stud wall and £150 for solid brick. Multiply this by the number of speakers to get a rough idea. Probably the best scenario is getting them fitted in a house while it's being built. The speaker system reviewed here is made up of a Stealth 5.2 package (3 x LR3 fronts, 2 x LR6 surrounds and 2 x B30 subs plus the SA 255R bass amp) plus an extra pair of LR6s for a 7.2 setup for approximately £7K. The units I auditioned are the recently-launched 'Mk2' LR or LineaResponse range. My audition took place at Habitech, Stealth Acoustic's UK distributor, in a 10 x 7m demo room with a 120-inch screen – the kind of environment these speakers are designed for. I played a variety of revealing material including A Quantum of Solace on Blu-ray. Listening to the system played at heroic levels, I slowly got used to the eeriness of not having a pair of large floorstanders and a big centre-stage box. The fiery bombing event in Quantum... played through the LRs didn't disappoint. They handled the extreme dynamic range, which features huge explosions but is also loaded with the subtle tinkling of glass at the periphery of the sound scene. Not all speakers manage this bandwidth with such aplomb. This remarkably powerful front stage trick is performed by the three LR3 units flanking and mounted below the screen. Each has a beefy 8-inch driver and triple array of mid/high frequency motors exciting carbon fibre disc diaphragms. Unsurprisingly, they go loud, high and deep. The coherence of the three front units is impressive, enabling a well-focused centre with a natural sound projection. The enveloping quality of the sound is greatly assisted by the wide polar dispersion pattern. Subwoofer performance of the two twin 8-inch units powered by the brand's SA 255R bass amplifier is more than adequate, despite not being of a 'crack of doom' level. At high levels, it was fascinating to touch the walls and feel them pulsing where they were hidden. Stealth Acoustics has made the framing of the sub-bass unit so that – along with special surface treatment– cracking of plaster at the edge of the speaker unit is not an issue, even during very high excursion. Again, being a flat diaphragm totally level with the wall, the non-directionality of low frequencies is further enhanced to produce an easy, enveloping quality to the bass. The LR6 side and rear surrounds played their part well, being capable of levels from the 6-inch woofers high enough to integrate with the larger front-stage drivers. They have an evenly spread vertical and horizontal dispersion, which is not advised in the THX manual. However, in Habitech's room there was a more than adequate definition of off-stage sound. This was likely helped by the speakers having a reasonably linear off-axis response, which I expected from a flat-surfaced unit. Both movies and music tracks lead me to conclude that Stealth Acoustics has come up with a remarkable product. Once the sound delivery from a flat surface has been mastered, there's a lot to be said for quality of the dispersion that results – namely in the 'airiness' of the sonic presentation. Unsurprisingly, though, there is some lack of focus, but that's in exchange for a neat architectural solution. I asked Stealth's engineers about the best environments for these speakers, and they claim that differences in wall materials have surprisingly little effect on their acoustic performance. They are all designed to operate within a wall aperture with just a few millimetres clearance. 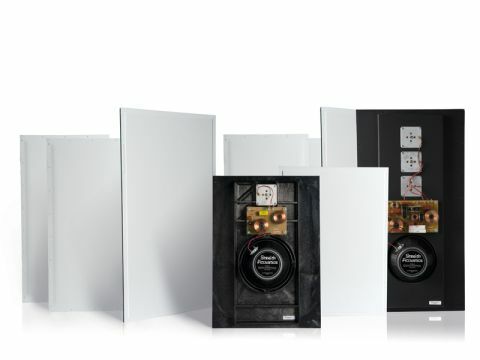 However, close-fitting mounting boxes are offered by Habitech – these are mostly used where sound leakage to an adjacent room needs to be reduced. I was also told that if the speakers are mounted into poorly-constructed stud walls, any vibration can usually be eliminated by filling the surrounding wall cavities preferably with sand, or expanding urethane foam. Vibration weak spots can be traced using a tone generator – this is something your installer can help with. Stealth Acoustics' home cinema array produces a massively dynamic sound with good resolution, and the flat membrane construction has wide dispersion properties which adds an extra ethereal quality to the mix. And it takes up no space. Definitely worth getting a demo if you like your cinema sound heard but not seen.